I am all about quick dinner ideas these days, but I?m even more about healthy homemade meals. Often it seems the two of those do not go hand in hand. However, these venison meatballs were actually quick to put together! I?m lucky to have a husband who loves to hunt so we have a freezer full of venison. If you aren?t as lucky, you can substitute ground beef and it will still be a delicious recipe! We had these meatballs with homemade sweet potato fries, but they would be great with spaghetti or as meatball subs, too! Combine all ingredients in a large mixing bowl, mix well. Roll ground venison mixture into approx. 1 inch balls and place on a baking sheet. Bake in oven at 350 degrees for about 30 minutes. You can roll them halfway through if you don?t want the bottoms to get too flat). Yields approx. 20-25 meatballs. To freeze leftovers, arrange on a wax paper lined cookie sheet and place in the freezer, once they are frozen you can transfer them to a freezer bag. This can be a tasty make ahead meal to pull out of the freezer for those days when cooking just isn’t going to happen. Add a green salad, crusty rolls and enjoy! What types of meals do you turn to for quick and easy dinner time recipes? Please feel free to share with me in the comments section! Lets share our best ideas. After all, we all need to eat! What I like to do is buy a box or two of scalloped potatoes….fix according to the directions and then I add a cup or so of frozen veg….or a mix of fresh and frozen…you never can have too many veggies. 🙂 Then I nestle sausages deep inside the whole thing. We love British Bangers…they’re a larger sausage then a breakfast sausage and usually come in a package of 6. Pop in the oven for the recommended time and voila….instant comfort food in a flash. I wish we had some venison…. Thanks so much for sharing on the (mis)Adventures Mondays Blog Hop. I look forward to seeing what you will share next. These sound fantastic! We’ve got some venison in the freezer, if I don’t use it all up (it’s getting pretty low, wasn’t a very good harvest year) I’m definitely going to try these out. Stopping by from the misadventures blog hop :). Great recipe, just made some. Btw, where is your farm? in maryland. thanks for reading the post! Made these tonight and served with an apricot habanero jam dipping sauce. Soooo good! This is my go to recipe with our ground vension. 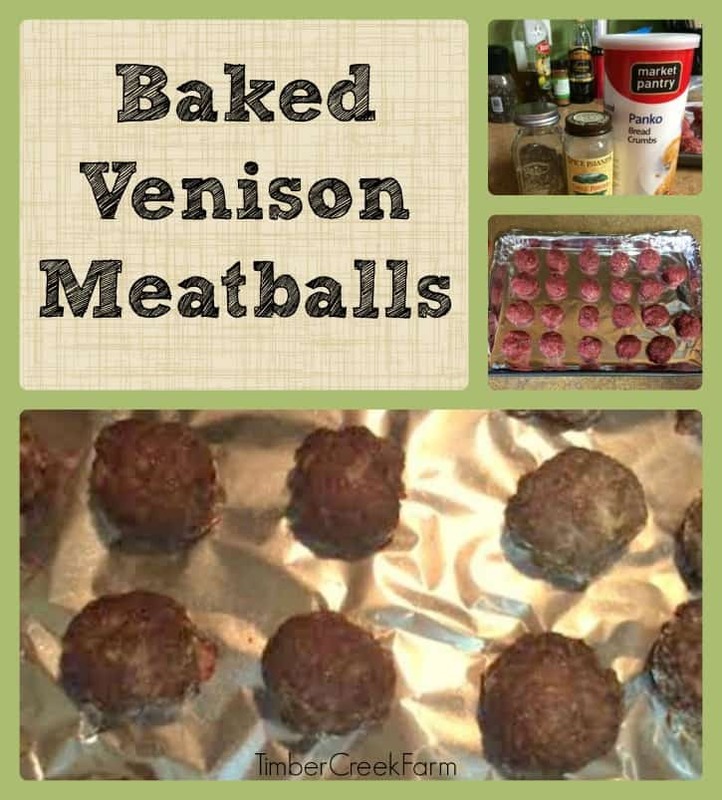 We got spicy italian ground venison but it has no flavor, so adding the seasonings from this recipe and making into meatballs gives it SO much flavor and covers up that “game” taste really well. Thank you SO much for sharing!